These are often called Salmonflies. 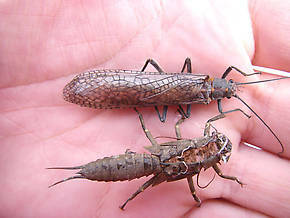 This family contains the largest species of stoneflies in North America, with many female specimens exceeding 50mm. Unlike the large and active predaceous Perlidae Golden Stones, they are primarily detritivores (Detritivore: eater of plant and animal debris) that move about slowly. The most important species is Pteronarcys californica. See its hatch page for details. 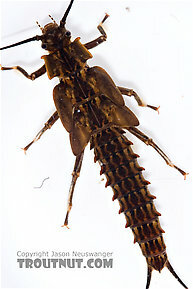 It takes them three years to develop to maturity, so it is useful for the angler to carry a variety of nymph sizes.